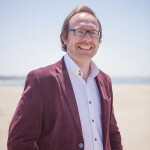 Sydney-based percussionist Claire Edwardes has put together an intriguing collection of marimba miniatures on this disc, ranging from transcriptions of Bach chorales, lute suites and various short piano works through to newly composed works for this disc. The playing is excellent. The opening Bach track showcases the beauty of the marimba in such an intriguing way. 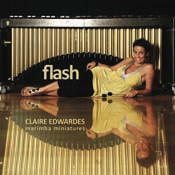 Claire definitively performs my piece Flash with precision, verge and vigour. 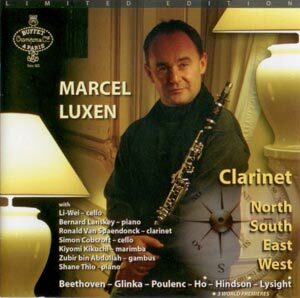 Singapore-based clarinettist Marcel Luxen is an excellent performer, and on this disc he is performing Nintendo Music. Nintendo Music certainly depends on having a top class player, and Marcel certainly doesn’t disappoint. One would think that he’s been playing the Nintendo Entertainment System all his life! Here is a Youtube clip of Marcel playing Nintendo Music. This disc, also released on Tall Poppies, continues to garner extremely good reviews. And with good reason – the playing from the two violinists is simply awesome. 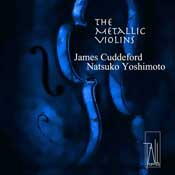 Anyone interested in violin repertoire would love this disc. There isn’t one dud piece or note on there. This entry was posted in New Recording News by mhindson2000. Bookmark the permalink.